The north of Pakistan was craggy and rugged, with deep barren valleys and high snowy peaks. But Xinjiang was a cold, dry desert. It was dusty wide open spaces and long open roads. Towns were few and far between. My first stop was the Silk Road town of Kashgar. It was an ancient crossroads; a green oasis with poplars lining the streets, but sandhills on the outskirts of town. 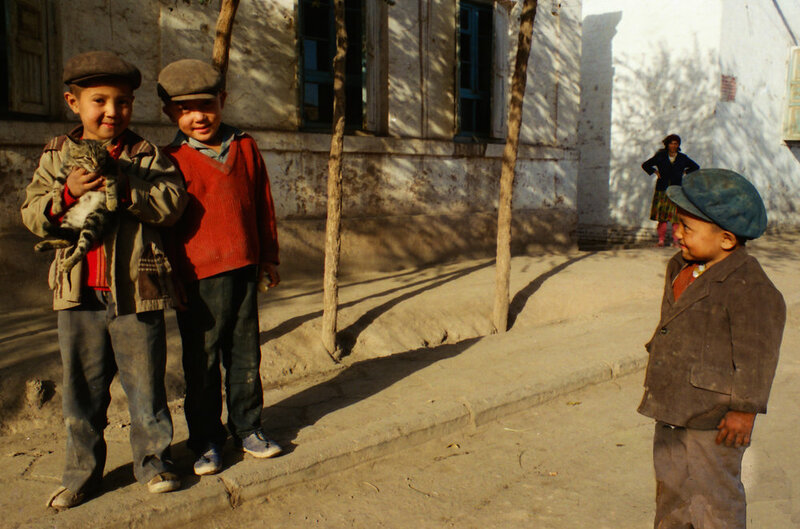 While I hear Kashgar is very different today, in the late 1980’s the Chinese influence was minimal. There were a few modern squat prefab buildings and occasional forlorn looking Han Chinese immigrants. But mostly, it was populated by distinctive Muslim Uyghur peoples living in sun-baked mud-brick houses. 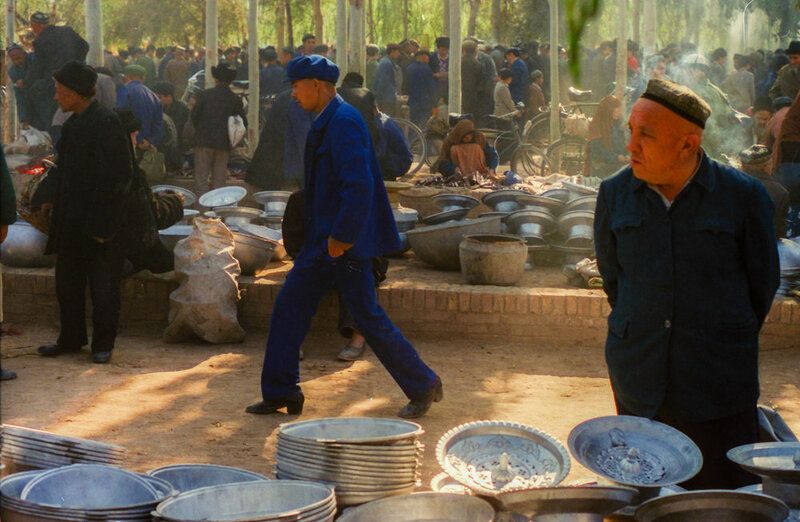 Kashgar felt more Central Asian than Chinese. I spent a week in the city, kicking around the dusty central square and mosque, walking through the bazaar. The highlight was a weekly Sunday market. Here thousands gathered; spread across several square miles. You could buy horses, camels, fabric, pots, pans and just about anything you needed. I even saw Snow Leopard fur for sale. My camera was a Pentax Spotmatic. I had a 50mm f1.4 and a 28mm Takumar lens. It was my first camera, and I had no previous experience as a photographer. 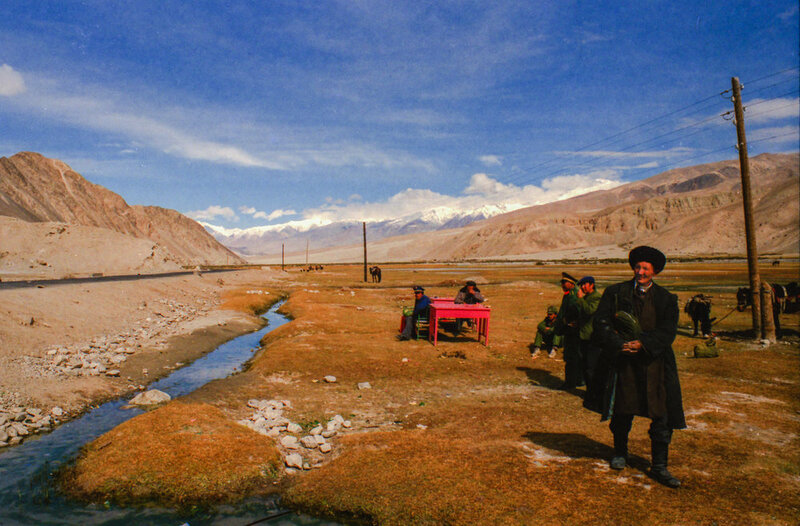 35mm camera film was tough to find in Asia - unavailable in Kashgar - so I only had a few rolls on me. Looking back at my photos of Xinjiang, I am surprised how many of them turned out good. From Kashgar, I took a three-day bus trip toward the next major oasis of Turfan - a city that sits in a dusty desert depression below sea level. Mostly, the bus crossed the flat grey desert. Hour after hour of emptiness, little of note to look at. The bus drove for around 14 hours every day, stopping after dark at a grimy truck stops for the night. All passengers shared a dormitory. The bus conductor woke us before dawn and hurried us onto the bus. My fellow passengers were mostly Han Chinese, they sat in the front, a few Uyghur sat in the back. The bus trip took a day longer than scheduled, arriving in Turfan about 12 hours late. Tourists or foreigners were uncommon in Xinjiang, but about half-way into the trip, an American woman joined us on the bus. She had two children, a boy and a girl. Blonde haired blue eyed twins about seven or eight years old. They seemed unusual travelling family. Whenever we stopped in some town in the middle of nowhere, large crowds gathered to observe these two young children. The American woman told me she planned to become a writer “...but you need to live an interesting life first, to be a writer”. I sometimes wonder if she ever wrote that book.